Android is software ‘set’ for mobile devices. 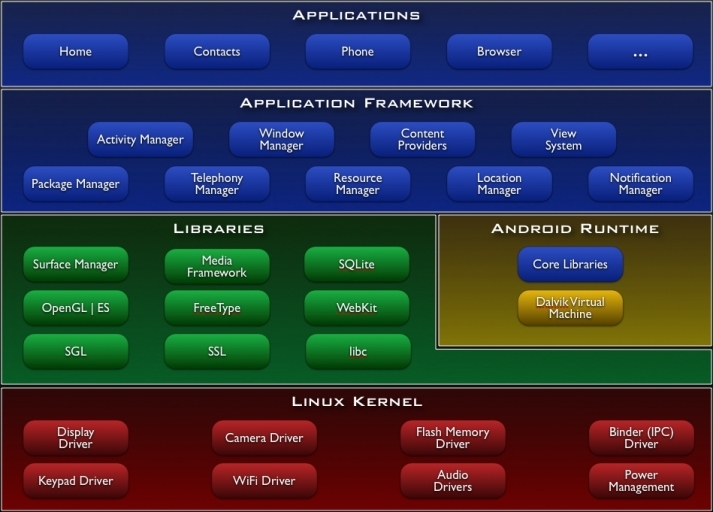 It is mainly an operating system based on Linux. Recently Canonical announced plans on Ubuntu for Android. Ubuntu on Android is not necessarily Ubuntu running on Android. It is just Ubuntu running on the side with Android. They both have one thing in common, the Kernel. The phone will just run like a normal Android phone, but when it is connect to a PC, you will get a similar experience as using Ubuntu. The advantage of this is will be to people who used to carry both a smart phone and a laptop. They no longer need to do that. One device is enough for them. Another benefit is if you connect your Android device to a TV via HDMI you don’t get the Ubuntu desktop: you get the Ubuntu TV interface. You can access online content just as you would with any Ubuntu TV. Another benefit is that no need to duplicate contacts in your phone, or even when composing emails, no need to add email addresses separately. This is because both the programs are interrogating the same single address book. Canonical is not exactly creating a mobile phone OS, the thing is it is easy to switch to desktop mode once you connect the phone to the PC. Android interface, from the base to the apps and all through, is designed to be used on touchscreen devices. This could explain though Windows had been on tablets before the iPad came around, it never garnered any traction in the market. Why? Because it was just a desktop OS being “forced” onto a new hardware. Canonical is not forcing a new OS on a hardware. When using the mobile device, it will be using Android just like before, but when you connect the device to a PC is when you get the Ubuntu experience with the Unity interface. In this way, people will get unique experiences in each situation without needing to learn a new platform. However the biggest problem that Canonical faces with Ubuntu for Android is the same same one that every Linux distro faces; ‘user adoption’. More than any other distros Ubuntu has a bigger and well established user base but that still doesn’t come to to a big number. Only about 20 million people using it world wide. Similarly Apple has had a tough time pulling users to Mac products, and has made a relatively small gain interms of market share because it is different from what users know and are familiar with. An Apple user could agree to this. I myself would like to push Ubuntu forward in the market and make it a real competitor to Windows and MAC. This entry was posted on Friday, April 27th, 2012 at 2:48 PM and is filed under Latest News, other Interesting stuff. You can follow any responses to this entry through the RSS 2.0 feed. You can leave a response, or trackback from your own site. Please explain this a little deeper (that is – how Ubuntu on Android will be an advance for me) and make the links at the bottom of your post work so that I just have to click on them to go the the relevant web page instead of having to cut and paste to my browser address bar. Also your image of the conceptual overview of Android is chopped off at the right hand margin and needs a caption. Please fix these Vicky. Yes I have made alterations to the article. Perhaps it is now simple to understand. I have made the links work as well. If you don’t mind, I just wanted to add my 2-cents worth in here regarding you posting. You start off by saying that Android is an operating system based on Linux. To be perfectly correct though, Android is not based on Linux, it is actually an open source distribution of Linux which by virtue of the fact you can actually get the open source code and make your own modifications. Furthermore, Android is not just the operating system. Android is a complete hardware and software platform. So just so you understand that any changes that come out in the platform are not directly going to be communicated to “other” Linux distributions. So keeping that mind this is all just to say “buyer beware” if you are going to run a different distribution of Linux on the Android platform. All of that aside, I really like your idea of running another desktop on the Android platform as I’m starting to see a lot of this cross-pollination going on with the Android platform. There is actually an Android-X86 project which is geared towards running the Android Linux distribution on the Intel 80×86 class of laptops and computers. You can actually boot it from a removal device such as a USB stick. Vicky – you should look at wssemtech’s blog – very nicely written and informative. Obviously done his work.